Here is another work from the Zencha no Kokoro ("Spirit of Zen and Tea") collection. "Scene of Cherry Blossoms and a Small Bird" (Ohka Shokin-zu 桜花小禽図) by Oda Kaizen (小田海僊, 1785–1862) shows a woodpecker perched in a blossoming cherry tree. Like a haiku or the tea ceremony, this work focuses on a specific moment in time — that point in the beginning of the cherry blossom cycle when some of the flowers are finally in full bloom, others still barely opening buds, leaves still outnumbering blossoms. In this state, the leaves provide dark color against which the white cherry blossoms contrast. This suggests another of the work's themes: balance. Balance can also be seen between blossom-carrying branches and the branch-bearing trunk, between occupied space and empty space, between the woodpecker's own dark and light colors, and between an immobile tree and a bird that has alighted there only briefly. Tea ceremony strives for balance between giving and receiving tea, between guest and host. 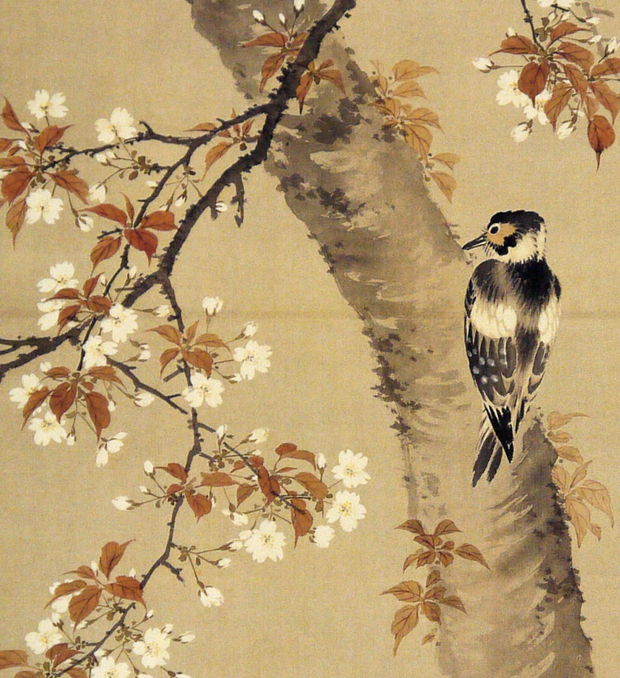 (In Oda's sumie painting, the tree is also playing host to the bird.) Through the tea, guest and host mindfully savor each moment. Likewise, a cup of tea by oneself is a mini-tea ceremony, an opportunity to savor the moment — before it flutters away.